Tayarani-Najaran, Z., Naseri*, N., Kheshami, S. (2017). Evaluation of cytotoxic effect of methanolic extracts isolated from endemic plants of Chaharmahal va Bakhtiari province on PC-3, MCF-7, Hep G2, CHO and B16-F10 cell lines. 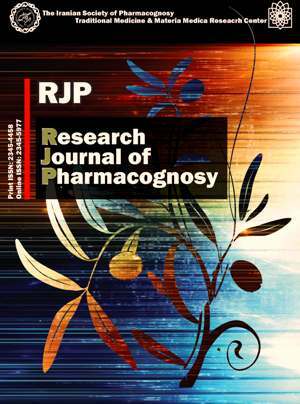 Research Journal of Pharmacognosy, 4(Supplement), 39-39. Z. Tayarani-Najaran; N. Naseri*; S. Kheshami. "Evaluation of cytotoxic effect of methanolic extracts isolated from endemic plants of Chaharmahal va Bakhtiari province on PC-3, MCF-7, Hep G2, CHO and B16-F10 cell lines". Research Journal of Pharmacognosy, 4, Supplement, 2017, 39-39. Tayarani-Najaran, Z., Naseri*, N., Kheshami, S. (2017). 'Evaluation of cytotoxic effect of methanolic extracts isolated from endemic plants of Chaharmahal va Bakhtiari province on PC-3, MCF-7, Hep G2, CHO and B16-F10 cell lines', Research Journal of Pharmacognosy, 4(Supplement), pp. 39-39. Tayarani-Najaran, Z., Naseri*, N., Kheshami, S. Evaluation of cytotoxic effect of methanolic extracts isolated from endemic plants of Chaharmahal va Bakhtiari province on PC-3, MCF-7, Hep G2, CHO and B16-F10 cell lines. Research Journal of Pharmacognosy, 2017; 4(Supplement): 39-39. Department of Pharmacodynamics and Toxicology, School of Pharmacy, Mashhad University of Medical Sciences, Mashhad, Iran. Background and objectives: To date, thousands of secondary metabolites have been isolated from plants and microorganisms and there is an unprecedented attention towards potential biomedical applications of natural compounds. In this study, cytotoxic properties of methanol extracts of Stachys obtusicrena, Aristolochia olivieri, Linum album, Dionysia sawyeri, Ajuga chamaecistus, Achillea kellalensis, Nepeta glomerulosa, Phlomis aucheria, Tanacetum dumosum, Dianthus orientalis, Scutellaria multicaulis, Cicer oxyodon and Picris oligocephalum which are widely grown in Iran, were investigated on PC-3 (prostat cancer), MCF-7 (breast cancer), Hep-G2 (liver cancer), CHO (ovarian cancer) and B16-F10 (melanoma) cell lines. Methods: The cancer cells were cultured in RPMI-1640 and incubated with different concentrations of the plant extracts. Cell viability was quantitated by Alamar blue® assay. The apoptotic cells were determined by PI coloring and Flow Cytometry (Sub-G1 peak). Results: The methanol extracts of D. sawyeri, S. obtusicrena, and C. oxyodon significantly decreased the viability of CHO cells. The Methanol extract of D. sawyer and L. album had cytotoxic effects on B16-F10 cells, whereas no toxicity was observed in MCF-7, Hep-G2 and PC-3 cell lines after incubation of the cancer cells with the plant extracts. The PI staining results showed that D. sawyeri, S. obtusicrena, and C. oxyodon in CHO cancer cells could induce apoptosis in a concentration-dependent manner. Conclusion: Screening plants to find the most cytotoxic extract showed D. sawyeri, S. obtusicrena, C. oxyodon and L. album had the potential for further analysis toward finding active phytochemicals with cytotoxic activity.